In 1907 a testing office was set up by the NSW government in Lithgow to monitor the quality of output from the local ironworks. Sometime between 1907 and 1910 Butler was appointed as a clerk and “typiste” to the station’s chief officer, Mr W.F Burrow. In 1910 at the age of 19 she was transferred to the NSW Department of Public Works in Sydney. Butler joined the Sydney office at a time when women were starting to enter the public service but still made up only a fraction of the government workforce. They were also limited to specific occupations; the NSW Public Service List for 1915 shows only a handful of women were employed by Public Works, mostly as typists, “shorthand-writers” and housekeepers. Butler’s appointment as the “first officer” of Bradfield’s new branch in 1912 was a remarkable achievement for a 21-year-old woman without any formal technical training. However, as she acknowledged in 1925, her Lithgow experience had given her a degree of practical knowledge. There is little information regarding Butler’s first seven or eight years with the branch; in 1916 she was still listed as a typist on an annual salary of only £110 (compared to Bradfield’s income of £1,000). It is clear however that she had started to work closely with Bradfield as he revised his plans and ran a strong public campaign in support of his proposals for the Harbour Bridge. As Bradfield acknowledged, Butler became his only assistant in developing the tender specifications for the bridge and dealing with enquiries from tenderers all over the world while he travelled overseas in early 1922. 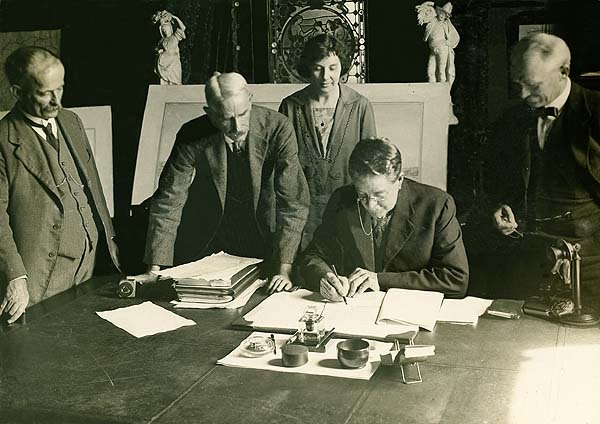 In addition, she drafted the “clear and informative notes” that accompanied the final legislation authorising the bridge’s construction which reportedly “materially assisted the passage of the Bill” through the NSW Legislative Assembly in November 1922. When the tenders were opened in January 1924, Butler later stated “I was the only woman present in the Minister’s room when the tenders were opened. 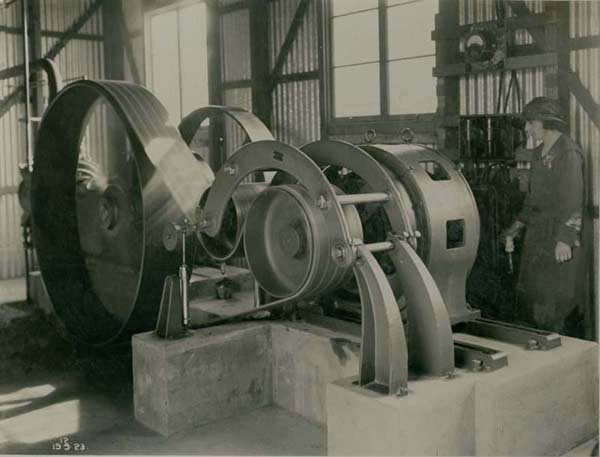 It was a most exciting moment.” It was an experience she repeated a couple of months later when the Minister signed the contract with the successful tenderer in March 1924. Early 1924 Butler left for London with three engineers to finalise design details and to review documentation with the successful tenderer, Dorman, Long and Co. Bradfield followed them a few months later but Butler “opened up the London office, and supervised the organisation of the contract”. The Australasian claimed that “Miss Butler is in charge of the visiting party, on £500 a year…”. If this figure is correct it represents a considerable increase on her 1916 salary – and she was certainly the first woman in Australia to have such a senior role in managing a project of this magnitude. Butler had already come to the attention of the press because of her articles and the novelty of a comparatively young woman occupying such a position. In 1922 she had been described as the “God-Mother of the Bridge” by the Blue Mountain Echo. However, while it was at times patronising towards her, the press made surprisingly little direct criticism of Butler. Instead, they complimented her expertise and noted her interest in surfing, tennis and dancing. As the Echo put it in 1924, “She is an advocate of hard work leavened with an equal part of healthy recreation”. The UK trip seems to have been the culmination of Butler’s work, at least publicly. 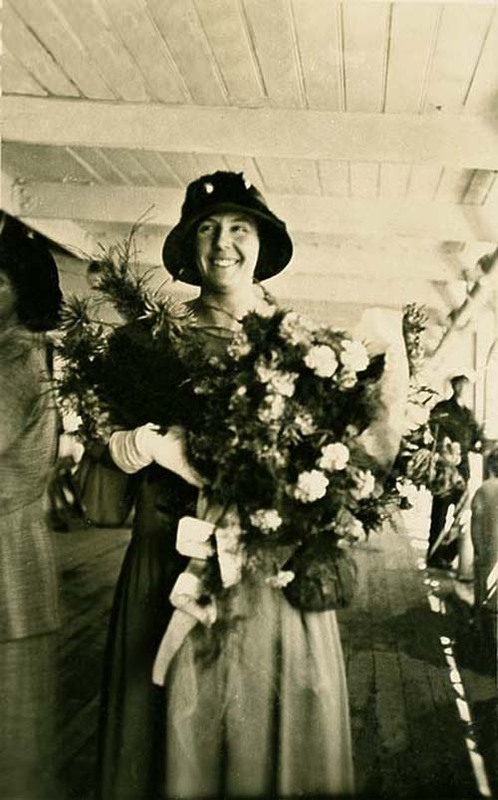 Her family, who seemed very proud of her achievements, celebrated her return to Australia in January 1925 with a party in Lithgow where she announced that she would “return to Sydney on Monday and on Tuesday enter in earnest on the six-years job of constructing the harbor bridge”. Butler wrote two more articles in early 1925, then her career as the bridge publicist seemed to dry up. In March 1927 she “retired” to marry Maurice Hagarty, a grazier from Cunnamulla in Queensland, who was six years her junior. At her Public Works farewell Bradfield thanked Butler for her contribution and presented her with, of all things, a grandfather clock. Of course, Butler’s retirement was really a forced resignation; until the early 1960s women in the public service had no option but to resign if they married. At this point Butler largely disappeared from the newspapers, apart from a few mentions in the social pages. In 1931 at the age of 40 she had her only child, Anne Josephine. She returned to Sydney for the birth and made other occasional trips to Sydney and the Blue Mountains, including one for a school reunion that coincided with the bridge’s opening in 1932. In 1936 Butler took her daughter to visit Bradfield and his wife in Sydney, admitting she “cannot curb her interest in the new Queensland bridge at Kangaroo Point [the Story Bridge in Brisbane, for which Bradfield was the consulting engineer] and feels she ‘hates to be out of it all’”. She visited Sydney again later that year for the marriage of her sister – and then, nothing. She seems to vanish from public view entirely until her death in July 1972. There are many ways to look at Butler’s story. The first is to admire the young woman who with a mixture of natural ability, ambition and a degree of luck overcame a formidable range of barriers to become chief assistant to Bradfield – and in doing so became the “only woman present” at this level on the largest infrastructure project that Australia had yet seen. Effectively Butler was Bradfield’s senior project manager at a time when this role encompassed far more then it would in today’s specialised era – not only did she prepare the specifications and deputise for Bradfield in dealing with prospective tenderers but also helped review the responses and then led the team which fine-tuned the successful tenderer’s plans – while acting as the project’s publicist to boot. This is also a story of how women found that ability, ambition and luck would take you only so far in 1920s Australia. Ironically, Butler may have never even made it into Bradfield’s office if she had tried to get there on the basis of formal qualifications; while 115 women had taken science degrees at the University of Sydney by 1920, they still faced being “stereotyped as ill-equipped to participate in the patriarchy of science”. Ultimately Butler’s career could not survive the brick wall that for decades thousands of women in the public sector faced – compulsory retirement upon marriage. There must have been enormous personal costs for women like Butler who were forced to make a binary choice between the desire to marry and the desire to continue in employment. That barrier is thankfully long gone, but others still remain, particularly in relation to engineering. In 2017 Engineers Australia reported that women still made up only 12% of Australia’s engineering workforce. There is a third story in Butler’s life – how, at a personal level, many people overcame their own prejudices to support her. As I noted earlier, her traditional Catholic family seems to have taken great pride in her achievements. Similarly, the press, while slightly bemused and at times patronising, mostly praised her abilities and achievements, even celebrating her successes in a traditional male domain. Of course, Butler’s most unstinting supporter was Bradfield, who may have had to overcome prejudices of his own. In many respects theirs was an unlikely professional relationship – on the one hand, a middle-aged male engineer with years of training and experience who was a regular Church of England attendee – and on the other, a young devout Catholic woman with no professional training. Yet not only did Bradfield recognise Butler’s ability and entrust her with enormous responsibilities, he also went out of his way to praise her achievements and to propel her into the public eye. Bradfield may not have regarded himself as a champion of women’s rights but his approach to Butler was well ahead of his time. However, while she enjoyed a degree of public recognition in her own lifetime, neither Butler’s own abilities nor Bradfield’s’ praise were enough to ensure her fame outlived her. This lack of recognition is both a symptom of and a contributor to the unfortunate reality that even today the limited number of females involved in engineering often find themselves, like Butler, “the only woman present”. * This paper is based on my initial research for a longer article I’m planning on Butler. It draws on primary sources from the time, many of which are available through Trove, as well as Raxworthy R. (1989), The Unreasonable Man: the life and works of J.J.C Bradfield, Hale and Ironmonger and Ellyard D. and Wraxworthy R. (1982), The Proud Arch: the story of the Sydney Harbour Bridge, Bay Books. The photos are from the extensive NSW State Archives Sydney Harbour Bridge Photographic Albums collection. Thanks also to Lyn Walsh for her post on Kathleen Butler in her Now and Then blog. If you have any additional information on Kathleen Butler please contact me on alexsg@msn.com.au. This entry was posted in Bradfield, History, Infrastructure, Public Transport, Sydney metro area and tagged Bradfield, Butler, Infrastructure, Rail, State Government, Transport. Bookmark the permalink.